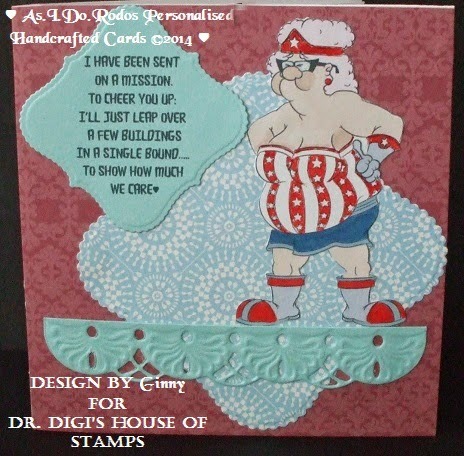 Today I'd like you to meet Blunder Woman from Dr. Digi's House of Stamps. Once she has that costume on she think she is invincible!! 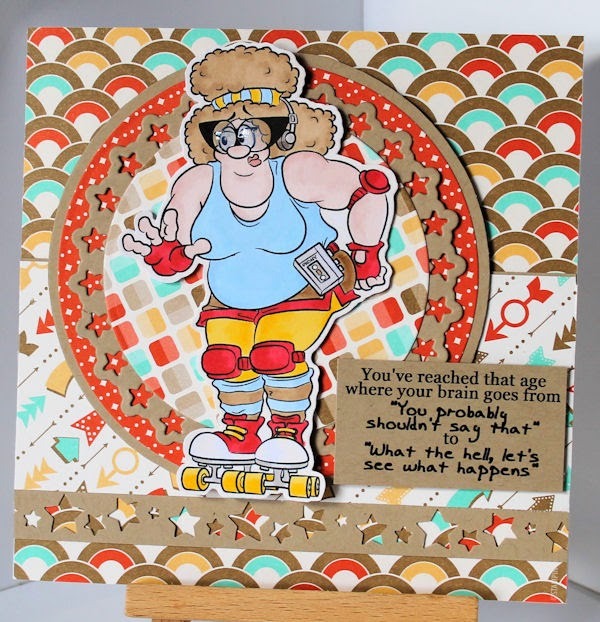 You will find her along with lots of other fabulous image HERE more details on this card can be found over on myblog. Dr. Digi's House of Stamps is world renowned for his funny and outlandish citizens, but the good doctor also has images suitable for the wee folks such as Nessie! One word of warning however, don't let Nessie's sweet demure look fool you, underneath that shy smile is a man eater and for goodness sake, don't tell the kids! Here another card from the new Techno Pack. This time I used the sentiment sheet. 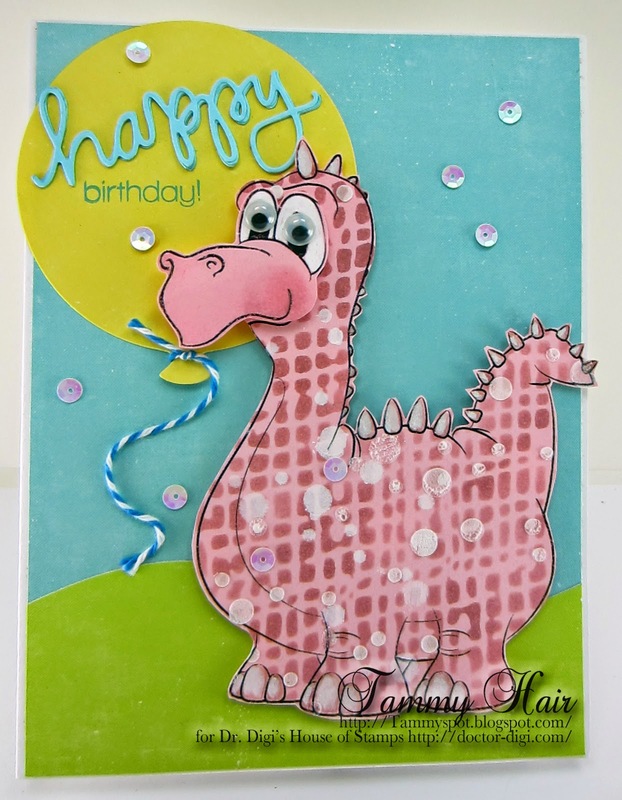 If you like to see how I made the card HERE is my blog. 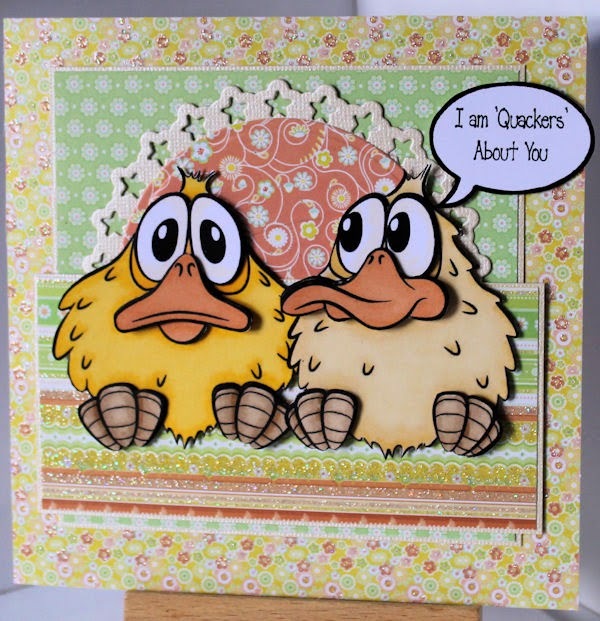 I could not resist these two little birds, they make me smile, and this speech bubble seemed very appropriate. Just don't ask them to sing though, they are a little rough around the edges! You can find Quackers HERE and I hope you have a great weekend. 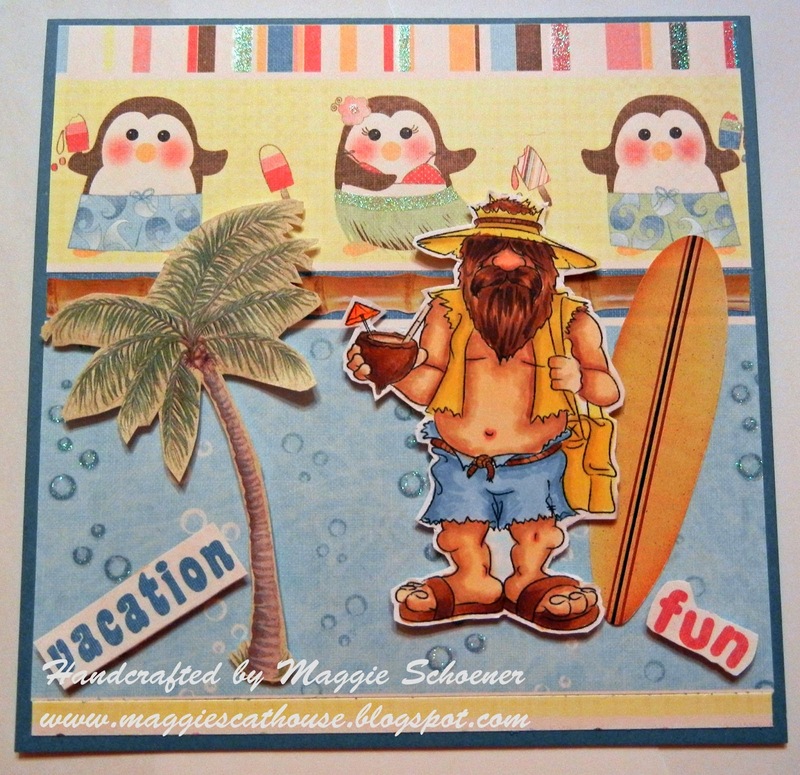 Maggie used Beach Bum Bob for her creation over at creative knockout challenge blog. How could you go wrong with hula penguins?? 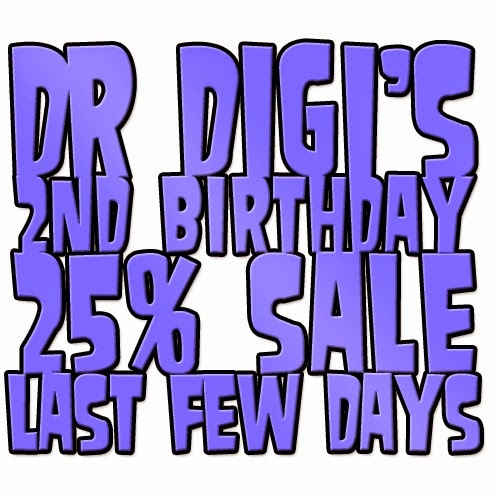 Just in case you've forgoten, Dr Digi's 2nd Birthday sale ends this Sunday. So you've only got a few days to make the most of our 25% discount we're giving as way of a Birthday present. 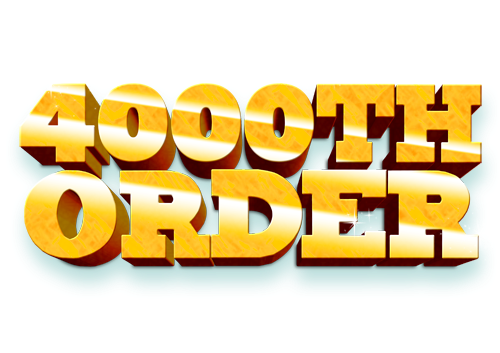 Just use the code drd2nd at the checkout. ......no! It's Captain Thunderpants! Ready to go at a moments (well, a few hours) notice to save the day! His cape is freshly laundered, as are his thunderpants! Buy Captain Thunderpants and Blunder Woman together and save a quid! Now you can be your very own Superhero! So look who is headed out for a little exercise on her skates! 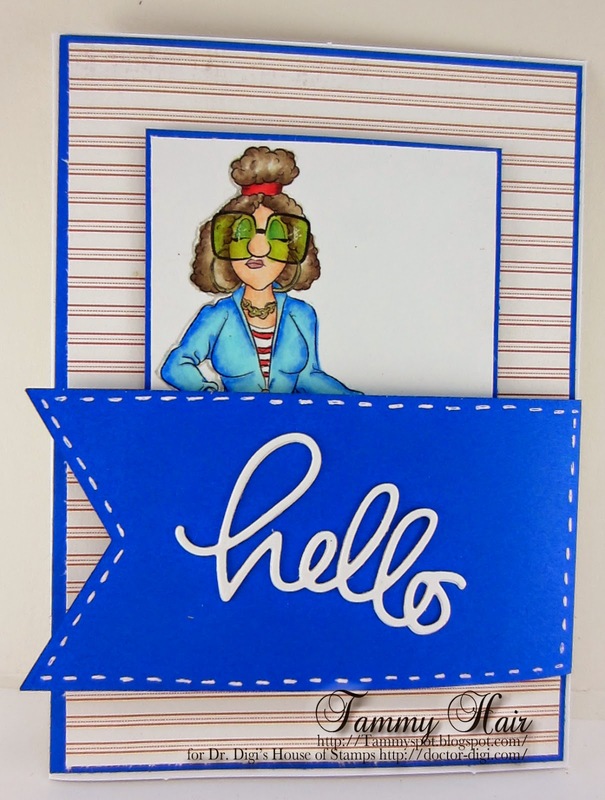 None other than Wired for Sound from Dr. Digi's House of Stamps, all decked out in an outlandish neon outfit, (nobody's going to miss seeing her), while be-booping to her favorite music, and sporting a sentiment from Funny Sentiments Sheet 02! If you ask me, I think she needs a really big pillow tied on her backside, not to protect her bum, but to protect the sidewalk when she hits it! Oh yes.....I'm sure that more than a few of us can relate to this sentiment! 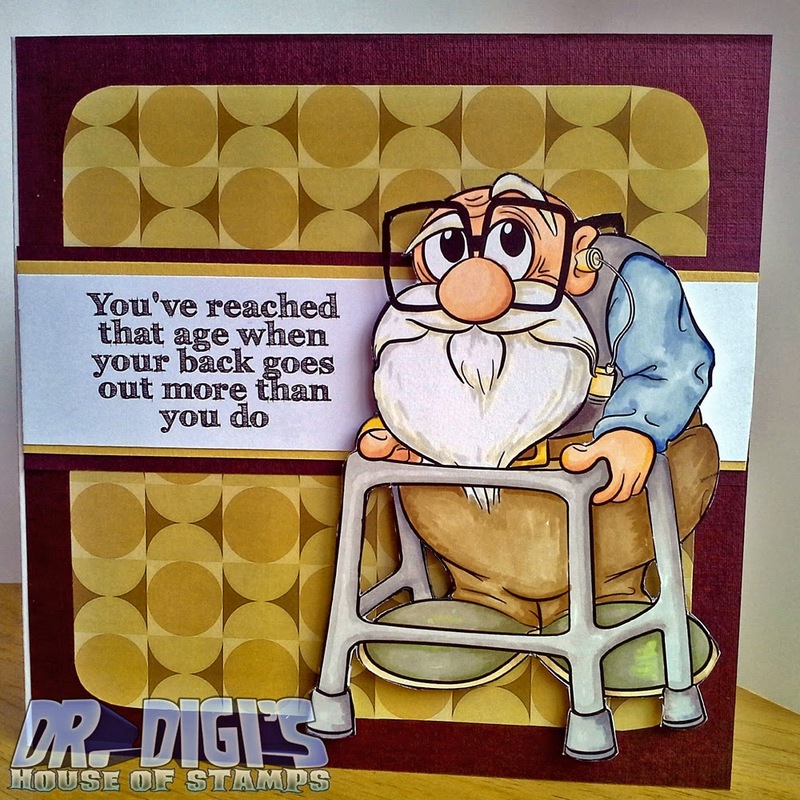 It's just one of the fun sentiments available at Dr Digi's House of Stamps. Of course, if you really are heading out on that hike, it's always best to take someone else along....preferably someone that is bigger and stronger than you! This delightful image, Hilda and Hercules, gave me a chuckle...and I'm really looking forward to sharing it! Look at Deirdery go, who doesn't remember those roller disco days, oh yes, I remember it's the young folk that don't! You do not know what you missed, the leg warmers, the Walkmans pumping the dance music of the day. Luckily Deirdery has that little bit of extra padding on her bottom to counter against those less elegant moments on the dance floor. You can find Deirdery Wired For Sound HERE, if you were less of a Walkman and more a shoulder stereo hoister then you can find Beatbox HERE and HERE is the beloved cassette from back in the day! Hi everyone, Stacey here with todays inspiration post. 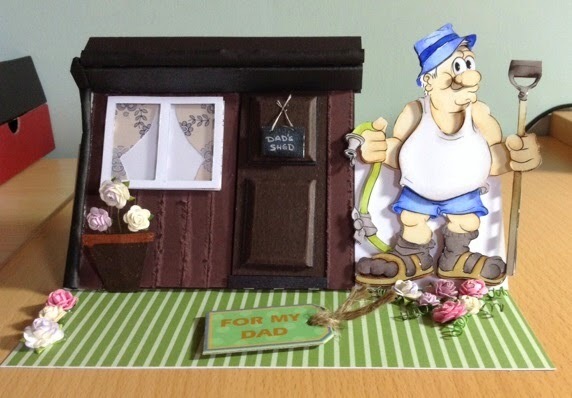 Today I am showing you Got Talent image which I used to make a Father's Day Card for my daughter to give to her dad. You can find Dr Digi over at the store and more details on this card over on my blog. Well as i'm sure the more eagle eyed among you may have spotted in a few previous posts.. It's our BIRTHDAY!!! 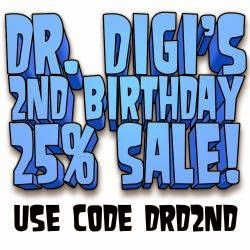 Yep Dr. D is 2 this month, and to celebrate we have a HUGE sale on. 25% off every thing in store... Yes you heard right 25% it runs from the last news letter ( which if you've not subscribed to you've lost valuable buying time.. what were you thinking ) to the next on the 29th so grab your discount while you can... Just use the coupon code drd2nd at the checkout. 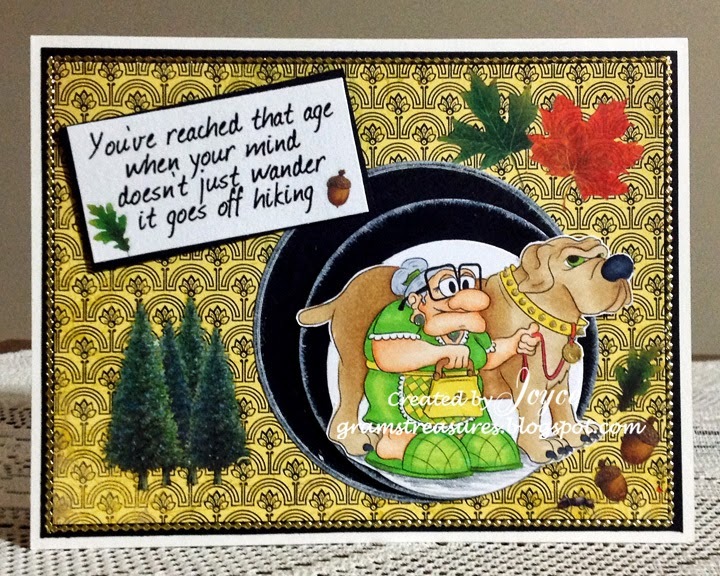 I've been having great fun using the Funny Sentiments 02 sheet, and this one in particular! 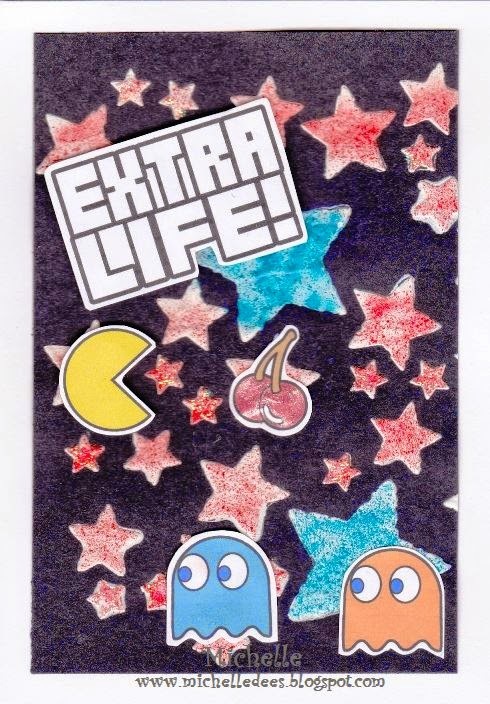 I've printed the sentiment onto kraft card and then embellished with some stars and funky 'tashes! 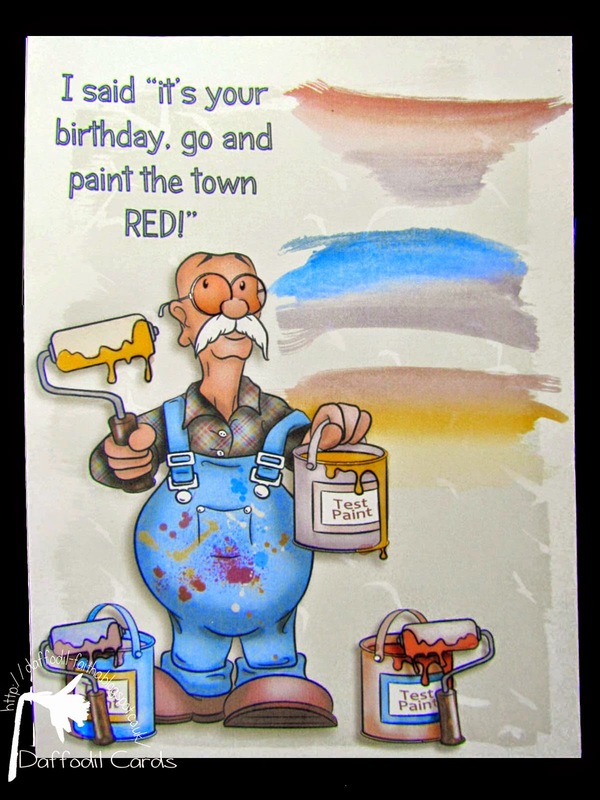 Perfect as a nod to the man who is hitting that particular age and needs to try and grow a 'tash!! 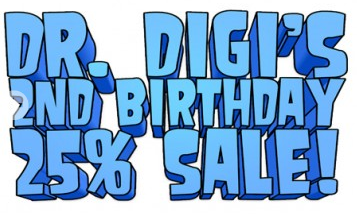 Don't forget the special offer Dr Digi has at the moment to celebrate our second Birthday! As it was father’s day 1 chose BIFFO well it is an excuse to colour him he is such a joy to colour and you can go mad with the colours. Biffo is sure to brighten someone’s day whatever the occasion. 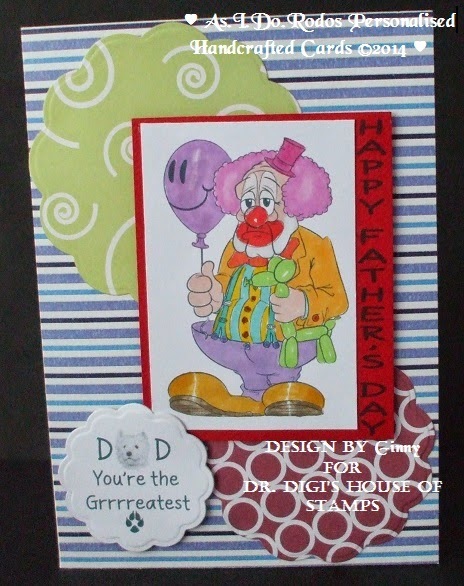 My card today features another fun image, Bundle of Joy, from the ever-so humorous Dr. Digi's House of Stamps! 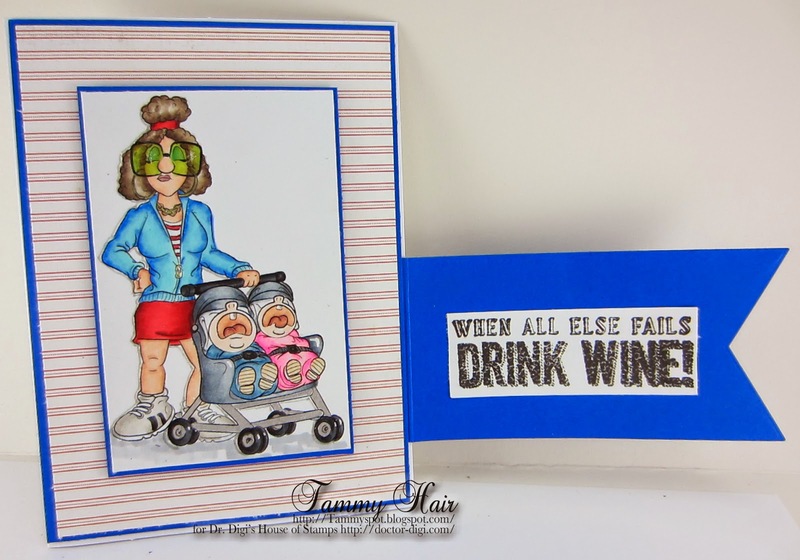 It just goes to show you that some days, all you can do is wine! I'd like to take a minute and wish Dr. Digi's House of Stamps a very Happy 2nd Birthday! I've been so fortunate to be part of the team and wish the good Doc, many more very Happy Birthdays and please keep the humor coming! I have got a 13 year old son and he loves to play anything on the computer. 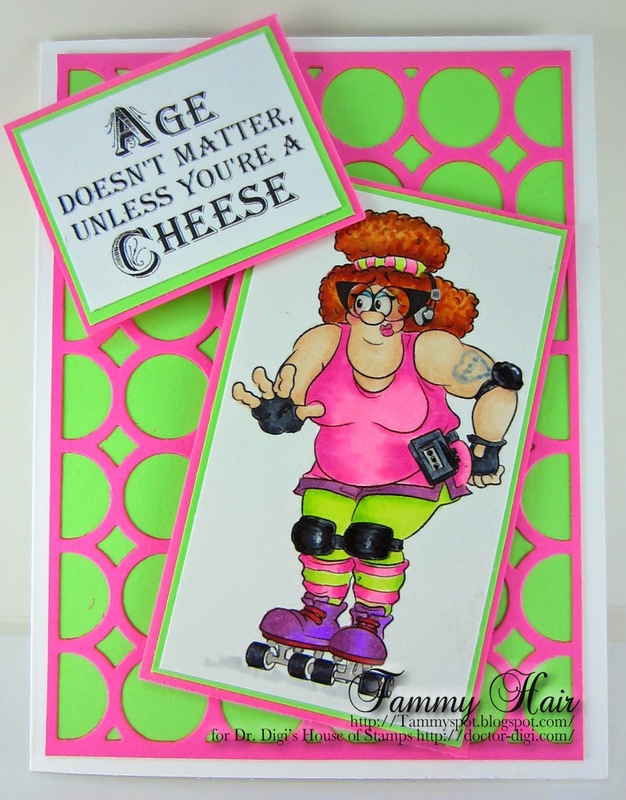 So he got this card for his birthday last week. But I have to say he did not know exactly what the background was. So I told him that was one of the first computergames. He was suprised it looks so funny. The image and background can be found HERE. If you like to know more HERE is my blog. 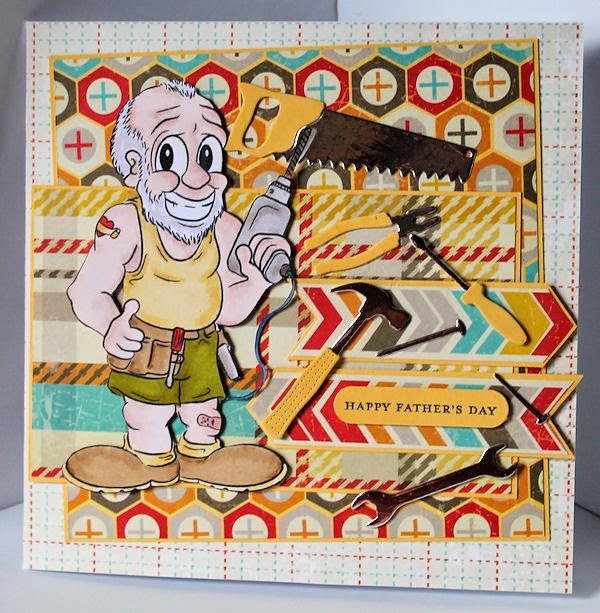 I have had to make a good few Father's Day cards this week and Dr Digi images are very much becoming my standby for all things male! Now you can see this Man About The House is a busy DIY-er, tools scattered everywhere, here's hoping the resultant masterpiece is somewhat tidier! You can find Man About The House HERE. Hope all Dads out there have a lovely day on Sunday. You can keep your Xbox, Wii & Playstations! 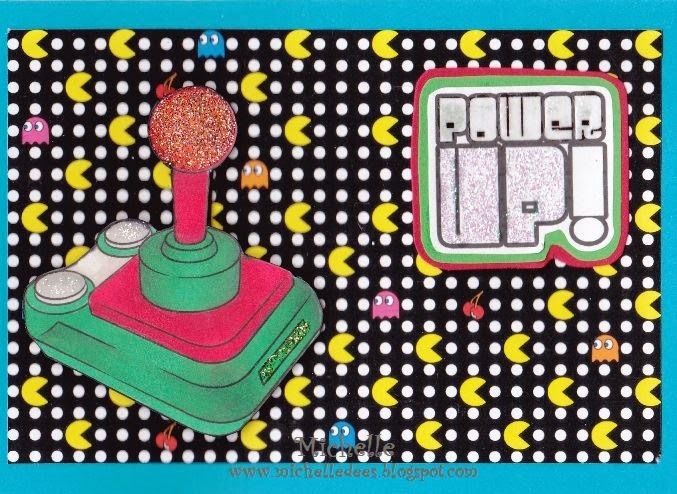 You cannot beat a good old game of Pac-Man on the Atari! They just don't make em like the little yellow guy anymore. Vince's Mrs is off on her jollies so Vince is taking the chance to lay about playing his favourite games in just his underwear this weekend. I wonder who is going to keep his cuppa topped up for him! The perfect image to send to the Man About The House who is rather handy with his hammer and chisel and will, at a moments notice, be prepared to wear the Tool Belt of Fixing Things. Forever with a cheesy smile, whiter than white vest and a pair of cut-off jeans, what more could a woman (with a leaky tap) want?! Good morning hope you had a wonderful weekend. Deirdery is enjoying her favourite past time soaking in a bubble bath and out of the way of Derek. She is enjoying her crafting paper and a cuppa ah bliss!! 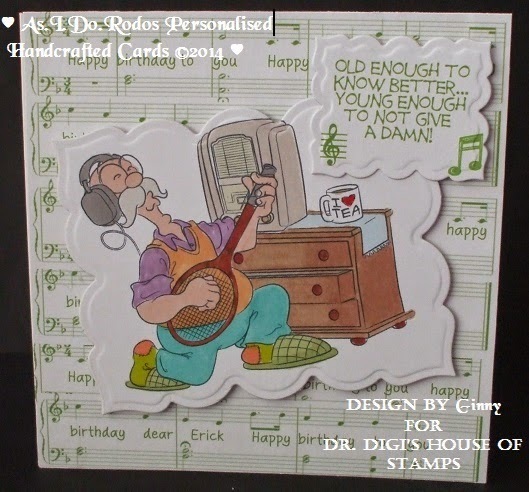 Dr. Digi's House of Stamps has done it again with the new release Got Talent! 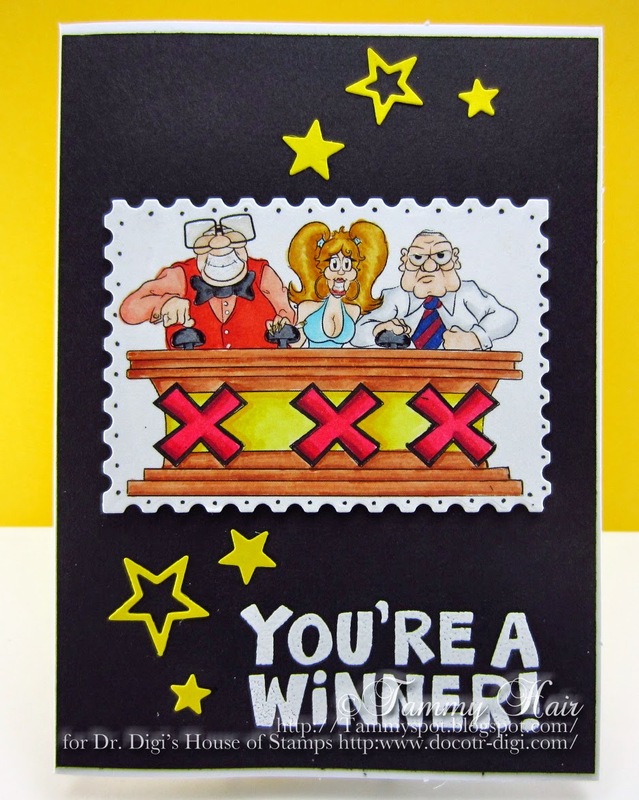 You're a winner in my book but the panel of judges, not so much! Here we go again, summer's upon us and all of those wannabe BBQ chefs are giving it a go. Of course things don't always go as planned, but isn't it wonderful when they do! 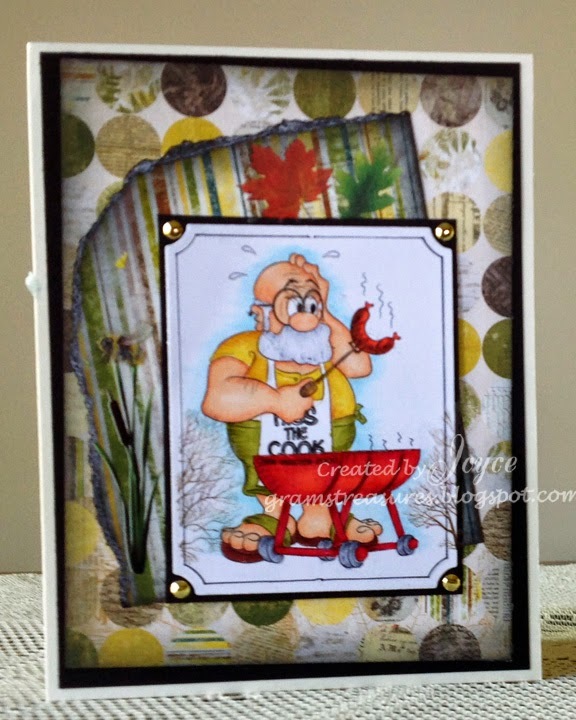 Here I have a card using another fabulous image from Dr Digi...... BBQ Bill. He appears to be a wee bit frazzled, as does his first attempt of the season. Better luck next time! A wonderful image for the upcoming Father's Day. It has to be said that a golf course on a sunny morning is a wonderful thing.......for partners and wives everywhere! It also has to be said that the pre coloured images from Dr Digi are the perfect way to get a quick card made when you realise Father's Day is actually a week earlier than you thought it was so only have one Saturday of selling left on your friend's market stall! Dr Digi cards are the most popular in these parts! 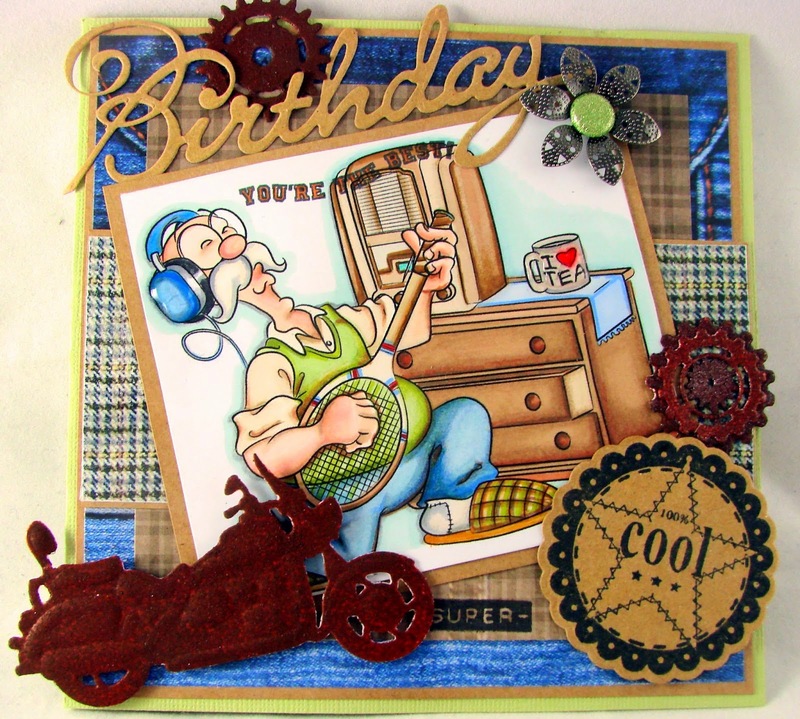 There have been plenty of fantastic cards posted on this blog by Dr. Digi's design team as well as all the crafters. So I thought I'd give it a go with one of our new samps. 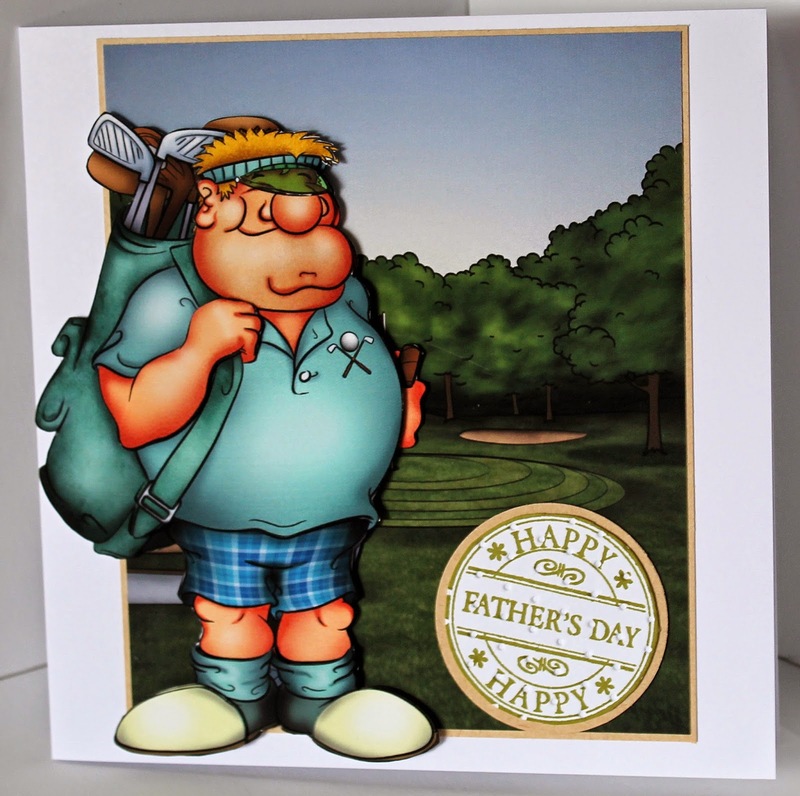 Here's my first ever card using Gramps..
Derek does like the thwack of the cricket ball against willow. Ever since he was a young lad with his jam encrusted face pressed up to the perimeter fence at Old Trafford, Derek avidly watches the worlds finest team. Although nowadays its usually via the portable telly in the caravan. The bathroom is the only place that Fiona gets a little peace and quiet! She is checking on Facebook and her emails. 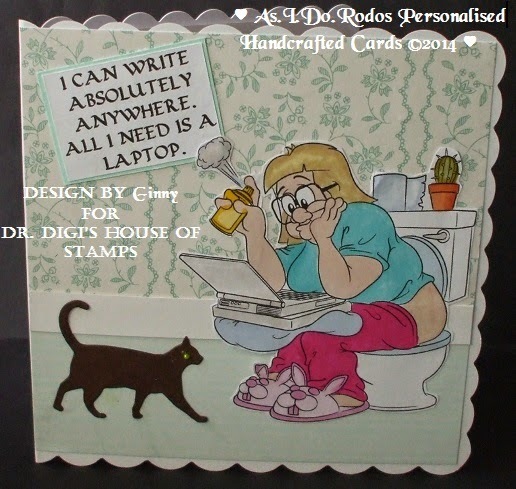 Have you shopped Bits and Bobs at Dr. Digi's House of Stamps? 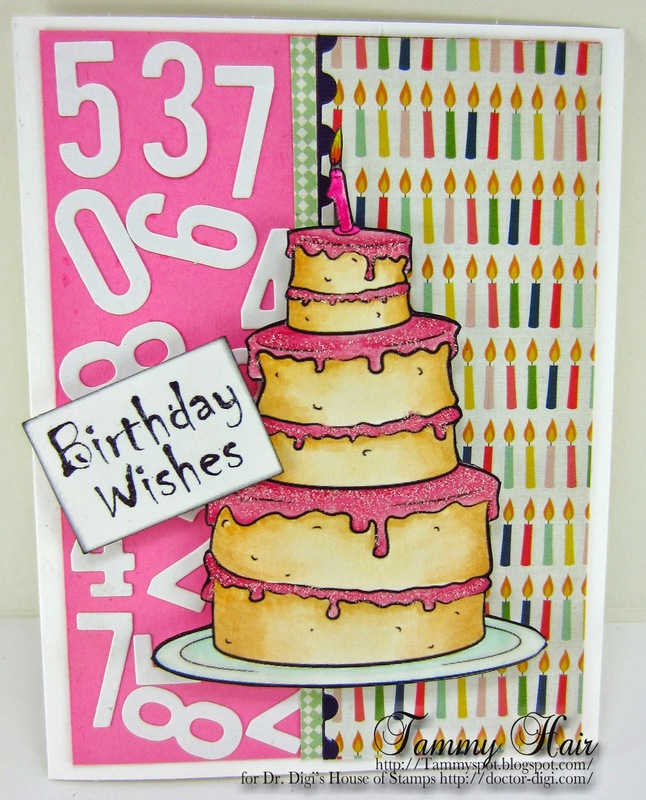 If not, you need to check out what's available such as this fun Birthday Cake served up in Dr. Digi's House of Stamps' humorous fashion. Rather looks like a cake I'm famous for making!